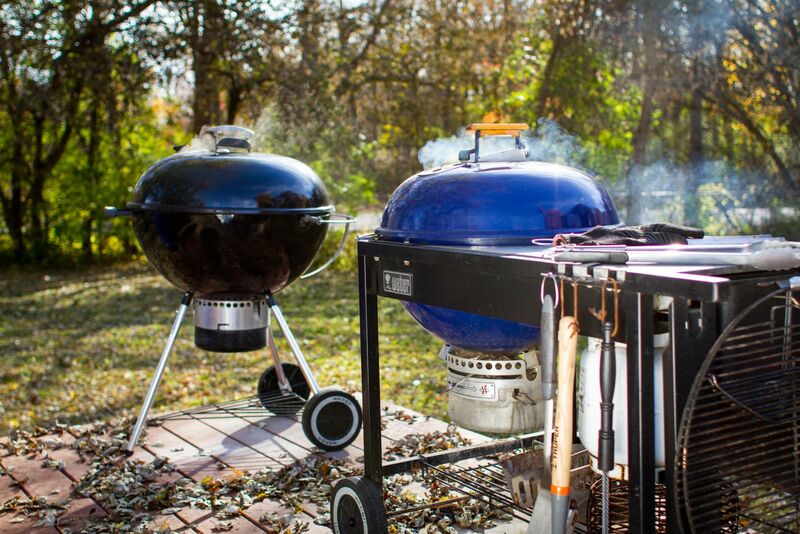 Out of all of my grills in the backyard, my kettle remains the most versatile of the fleet. It handles any meal, large or small, and can adapt to any type of cooking I throw at it, even smoking. I can still remember grilling my first grilled Thanksgiving turkey. My Performer was red, and I had hair. Two things I haven’t seen in some time. What I also remember is being daunted by what is really, a fairly easy process. 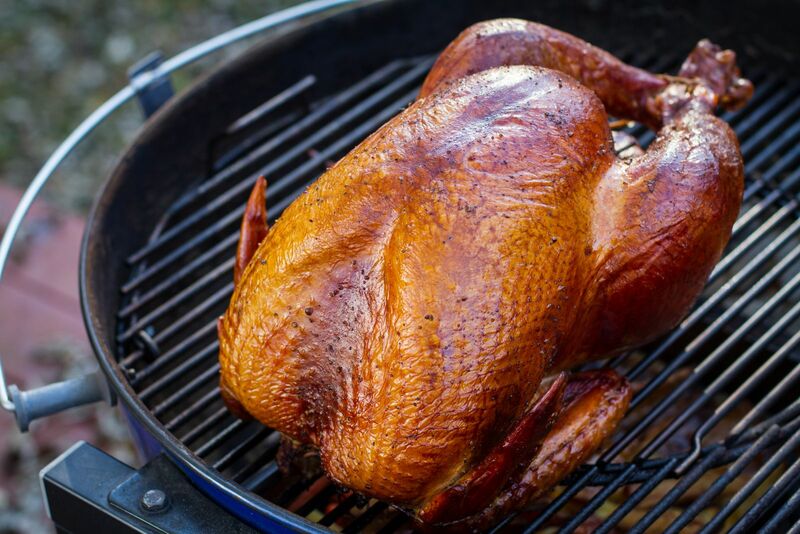 If you can grill a whole chicken, you can grill a whole turkey, and while a traditional roast turkey is superb, I like to take advantage of everything the kettle has to offer, so I add a little bit of smoke. 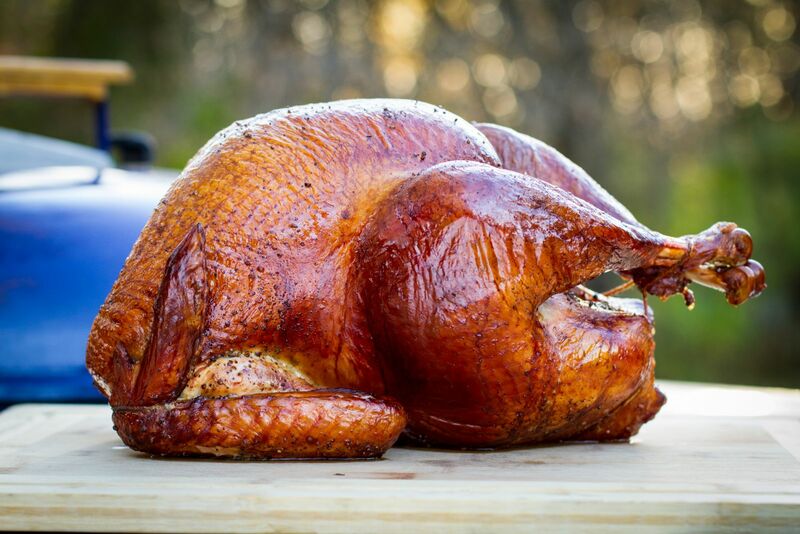 Not only does adding smoke make for an amazing tasting turkey, but it’s also a foolproof way of adding just the right amount of color. Your Thanksgiving feast will not only taste great but will be amazing just to look at. Grab those cameras everybody! 1. 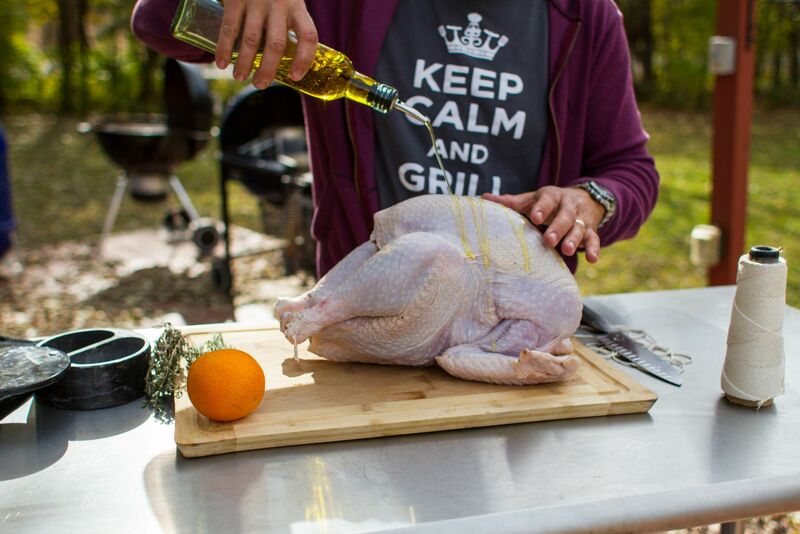 Prepare the turkey by lightly coating it with olive oil. 2. Season both the cavity and the skin with generous amounts of salt and pepper. 3. Stuff the cavity with a sliced orange and a bundle of fresh herbs. 4. With butcher twine, truss the turkey. I like to tie together the legs, then wrap the twine towards the neck where I secure the wings in place. 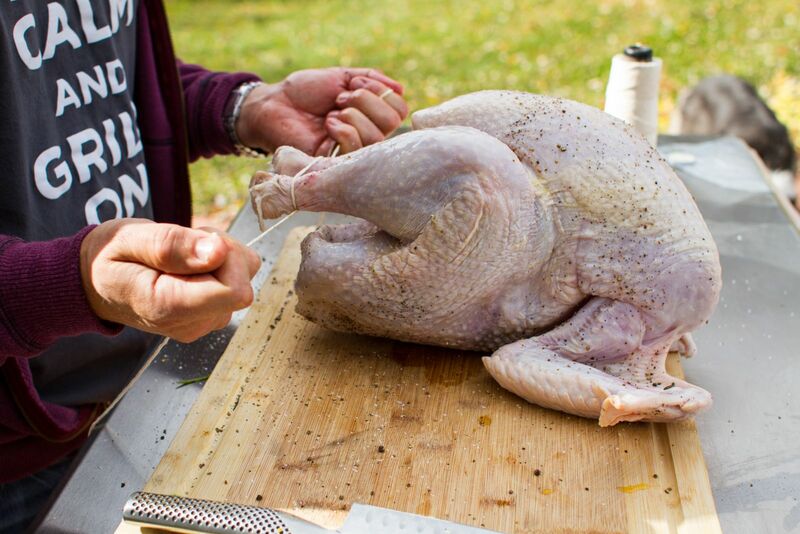 Trussing helps promote even cooking and makes for a more attractive looking bird when finished. 5. Prepare the grill for indirect medium heat (350-375 F) by lighting half a Rapid Fire Chimney Starter full of Weber Briquettes. You can choose to spread the coals around half of the perimeter of the kettle or put even amounts on each side. 6. 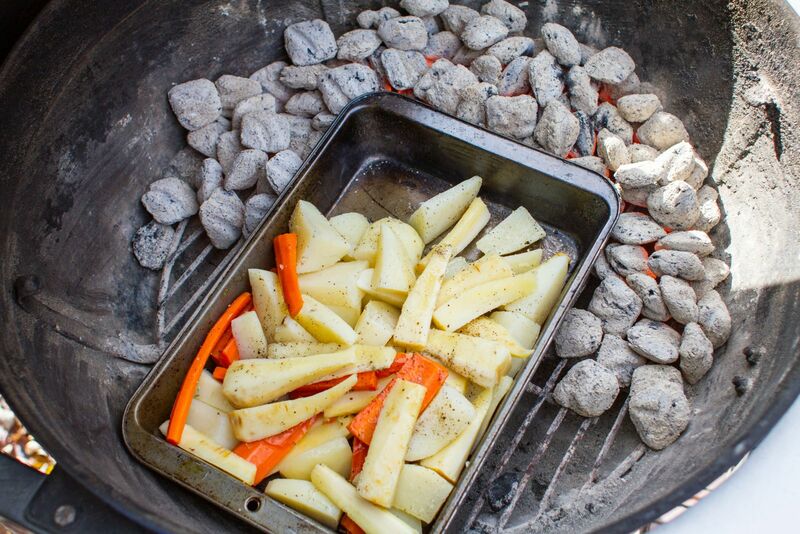 Using the kettle to smoke and roast a turkey makes a perfect opportunity to roast root vegetables in the drip pan. 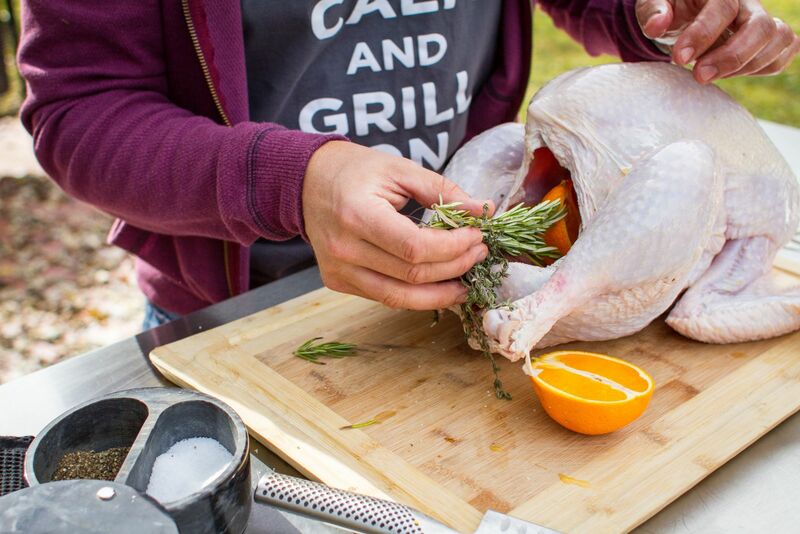 Not only will you have an amazing side dish, the pan helps keep the charcoal briquettes in place and out from under the turkey. 7. 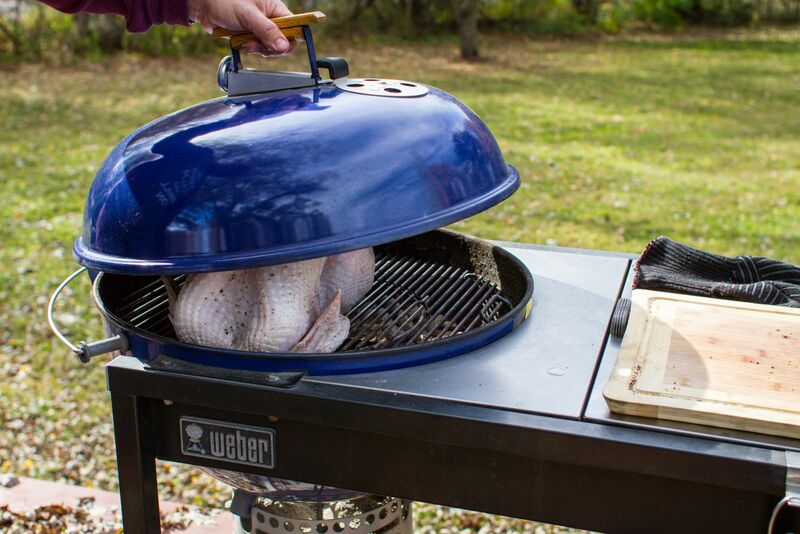 Place the turkey on the grill with the legs towards the coals. Place one chunk of cherry wood on the coals and lower the lid. With wood, a little goes a long way, so be sure not to overdo it. One chunk is enough for me but if you like it stronger you can add more. You don't need to presoak wood chunks but if you opt to use wood chips, you will want to soak them for 30 minutes - 2 hours. 8. 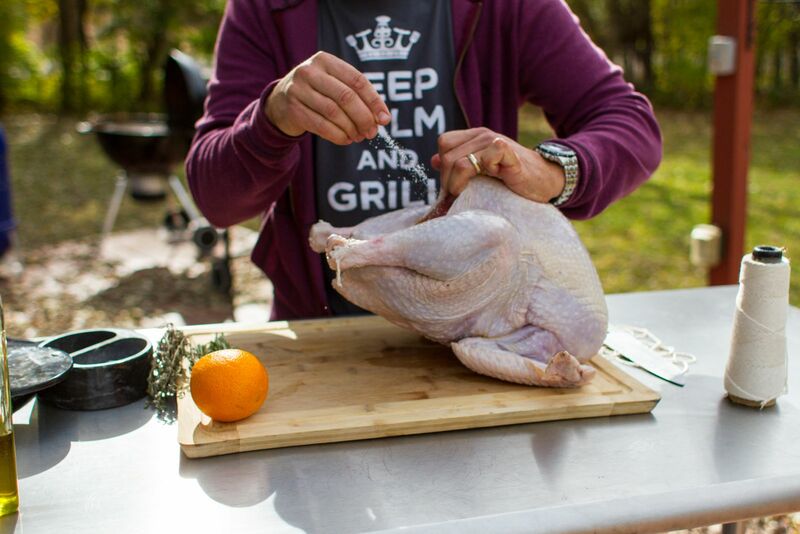 Grill the turkey for approximately 2 ½ hours, or until the internal temperature in the deepest part of the thigh reads 165 F with an instant-read or iGrill bluetooth thermometer. 9. 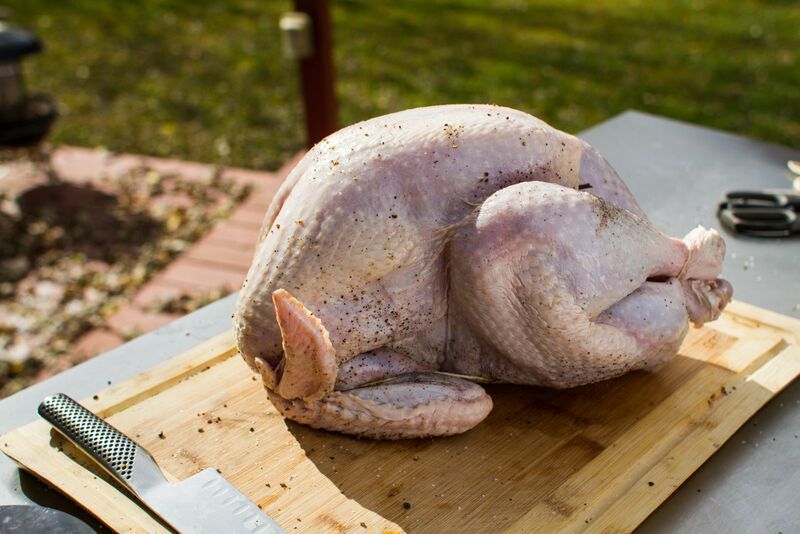 Remove from the grill, loosely tent with foil, and allow to rest for 20-30% of the cook time. Carve and enjoy. Just make sure you get the picture taken before your guests dig in and share it with us on social using #BestTurkeyEver!